What do you want? Actually, no need to answer – whatever it is, just head to the Weekend Market. Approaching Chatuchak Market (or ‘JJ’) from Mo Chit station can be slightly intimidating; sprawling stalls line the edge of the park from the very bottom of the BTS steps to the entrance of the main market, and hoards of hungry shoppers swarm to find the cheapest knick knacks. These stalls outside the official boundaries of the market are open longer and can be fantastic value – the vendors do not pay to be inside the market and prices often reflect this. Our favourite purchases here have been small leather bags for 80 baht (about £1.70) and white work shirts for 100 baht (about £2.10). The market itself is a shopping heaven for some (Sarah), a disorientating sauna with no escape for others (Charlotte)! Widely known as the largest market in Thailand, and one of the biggest open air in the world, it is a huge maze. Although there are maps that attempt to help tourists find their way around the 27 sections, prepare yourself for getting lost anyway, and never seeing the same stall twice! There is a very diverse mix of shops, and pretty much anything sellable is sold here. Some sections are blatant at targeting tourists, and retail everything from T shirts to boxer shorts with the classic Thai slogan ‘Same Same’ printed on them, but many areas are simply for the locals – selling piles of electrical appliances and home textiles. The vintage clothing section is fantastic; studded jackets with rolled sleeves, vintage printed T-shirts, rainbow bright high-waisted jeans and rows of intricate costume jewellery. A short walk around the corner will reveal something entirely different again; several pet dealers hawking tropical fish, puppies and lizards. Be careful to pay attention to the warning signs – don’t take any photos (we were very sneaky about it) or play with the animals; you wouldn’t want to insult anyone or catch anything! Make sure you take a break from the heat and crowds and head for the less claustrophobic open area centre of the market. 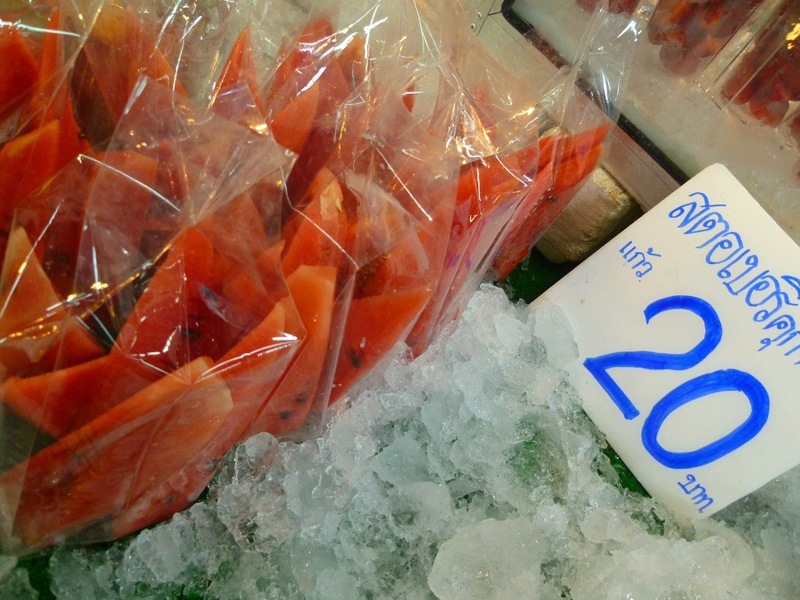 There are loads of food vendors – try the fresh seafood on a stick, the 10 baht cola ice lollies and the ice cold fruit punnets. 4. Take your time and take plenty of breaks – there’s so much to see! This entry was posted in Thailand and tagged bangkok, chatuchak, clothing, food, jj, market, shopping, thailand, weekend by Two One-Way Flights. Bookmark the permalink. I remember that market and it was so much fun! I just love Thailand. Your blog has been so much fun to read and recall the places I have been and some new ones I would like to check out. One of the things I remember eating there were these little one bite things that were a mix of flavors wrapped up in some sort of leaf. There were a few peanuts, some honey or something sweet, something spicy and it just sounded awful till you tasted it. Was delicious. The Thais have a way of mixing unlikely flavors creating unique culinary experiences. Thanks, we head there almost every weekend! You’re right, the food is unbelievable and definitely the highlight of the market – our favourites are the sea food and all the fresh ice creams! Hi all, here every person is sharing these kinds of knowledge, so it’s nice to read this web site, and I used to pay a visit this blog every day.